Our preschool program is divided into four age groups that help children transition from parent-assisted, semi-structured classes to independent, skill-focused rotations. Emphasis is on gross motor development, shape and skill recollection and repetition, and having FUN! Our preschool gymnasts attend class in one of two specifically designed gyms with brightly colored mini-sized equipment. Rug Bugs rule the gym! Children explore exciting equipment and activities - climbing through tunnels, rolling down the giant "cheese", jumping, swinging, stacking, sorting and playing with new friends. Rug Bug class is set in a semi-structured environment with beginning and ending group activities designed to instruct and introduce listening and following. Parents are with their children throughout class. The first step toward going “solo”….The Mini Gym Bug class begins preparation for the “solo” experience. Longer segments of structured activity are introduced. Parents provide guidance as needed but tend to play more of a background role as children learn to follow and stay with the group. In this class, obstacle courses allow children to work with an instructor on skills as well as providing opportunities for independent practice on their own as they move through the different activities. Target teaching ratio is 6:1. The Mini Gym Mini class offers students their first classroom experience without assistance from a parent. Students will continue to practice listening, following simple directions and taking turns with other students. The format in this class focuses more on instruction and giving students simple corrections to assist with skill mastery. Children will move through an obstacle course where they learn a skill with the instructor, and then have many opportunities to swing, climb, jump, and develop strength and coordination by practicing activities on their own. Target teaching ratio is 6:1. Children entering the Jumpin’ Gym Mini class will be given more opportunities for skill mastery. As children develop they can begin to grasp more concepts and make corrections as they learn basic gymnastic shapes and skills. In this class children are being introduced to skills they will work on in the School-Age program. Children will move through an obstacle course where they learn a skill with the instructor and then have many other opportunities to swing, climb, jump, and tumble. Students develop strength, flexibility and coordination by practicing activities independently. Preschool gymnastics has also been linked to reading readiness, and the structure of this class provides social preparation for the school classroom. Target teaching ratio is 6:1. 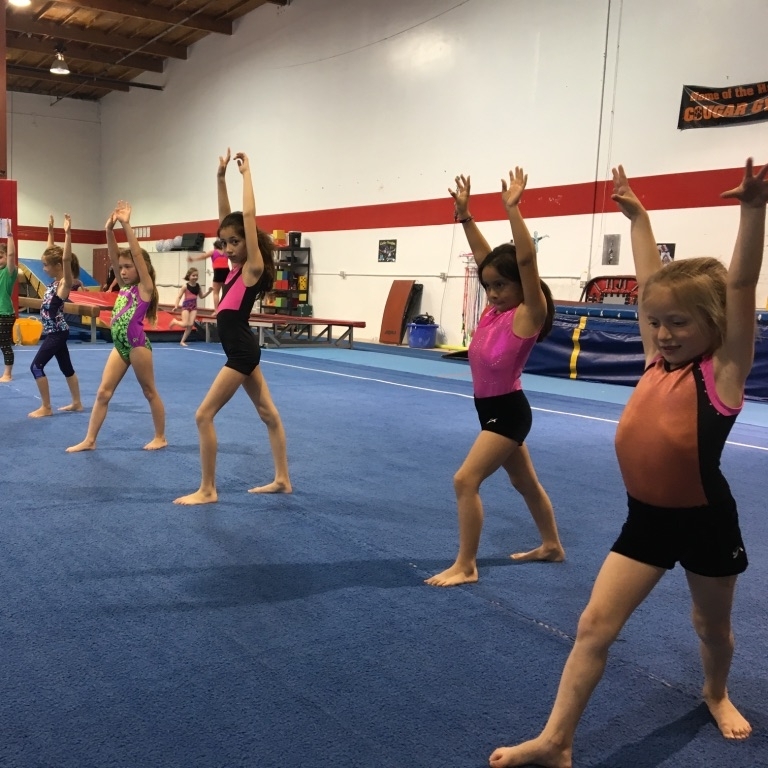 We offer a non-competitive developmental curriculum based on the Junior Olympic Program of USA Gymnastics. Classes are offered for Levels One through Four for both girls and boys. Girls learn skills on the four women's Olympic events: floor exercise, balance beam, uneven bars, and vault. Boys learn skills on the six men's Olympic events: floor exercise, pommel horse, still rings, vault, parallel bars and horizontal bar. 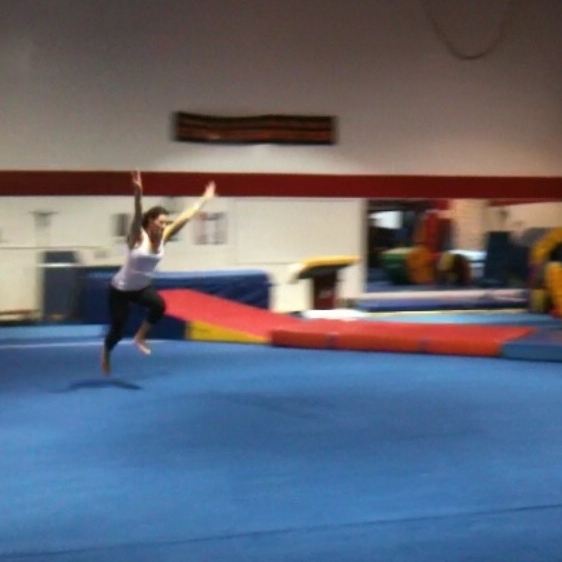 Trampoline is used periodically in classes as a supplemental training tool. An ongoing evaluation program allows students to advance and earn ribbons as they master the requirements of each level. Every eight weeks, students are evaluated and receive progress reports indicating which of the required skills have been mastered. At the completion of each level, students receive a certificate of mastery and are invited to move on to the next level. Level One is designed for the beginner gymnast. Focus is on teaching proper techniques, body shapes and positions. This level places great emphasis on fundamentals, safety, and fun. Level Two classes are specifically designed for the gymnast who has mastered the fundamentals of Level One. Students may enroll in Level Two classes with instructor approval only. Level Three classes are specifically designed for the gymnast who has mastered the fundamentals of Level Two. Students may enroll in Level Three classes with instructor approval only. Level Four classes are specifically designed for the gymnast who has mastered the fundamentals of Level Three. Students may enroll in Level Four classes with instructor approval only. Our Teen classes focus on having fun, and developing strength and body awareness in a supportive, non-competitive environment. Learning new skills helps teens build confidence that transfers to school and life. No previous gymnastics experience is required. Our Adult class is for students 18+. Whether you are a retired gymnast or just want to try a new fitness class, this is a fun workout. Focus is on strength, flexibility, body awareness, and learning new tricks. No gymnastics experience is necessary. One 1-hour class weekly is $101 per 4-week session. Welcome to sign-up for multiple weekly classes.